Marine debris or garbage consists of man-made materials that collect in our oceans. Plastics, wood, metal, and other manufactured products are now found throughout the world’s oceans where, after being carried by wind and currents, they often form large garbage patches within circular ocean currents or gyres. There are several of these garbage patches worldwide with the largest in the Indian Ocean, North and South Atlantic, and North and South Pacific. The North Pacific Gyre or Great Pacific Garbage Patch, stretching between Japan and California, is so large that it is divided into eastern (between Hawaii and California) and western (near Japan) segments. While these “garbage patches” conjure up images of floating islands of trash, they are often composed of smaller particles that cloud the water and larger pieces of debris that sink to the ocean floor. Current estimates show that there are over 5.25 trillion pieces of garbage in marine environments worldwide. These garbage patches continue to grow as plastics and other goods make their way to our oceans. Most of this garbage, about 80%, comes from land. Inefficient industrial practices and over-taxed sewage or waste removal centers allow garbage from our streets to reach waterways. Whether carried by rivers or floods, these items then make their way to the ocean. The remaining 20% is dumped directly by ocean vessels like fishing trawlers and cargo ships as well as offshore oil drilling rigs. Cruise ships are one of the biggest culprits representing less than 1% of the global merchant fleet but producing about 25% of merchant vessel waste. For marine animals, most harm from marine debris revolves around ingestion and entanglement. Sea turtles have been known to mistake floating plastic bags for jellyfish. Sea-faring birds such as albatrosses confuse floating plastic pellets with fish eggs and feed them to their young, resulting in compacted digestive tracts, ruptured organs, and starvation. Whales, sharks, and sea lions drown after becoming entangled in discarded fishing nets. Debris collecting on the ocean surface can interrupt sun exposure and growth of plankton and algae that form the base of the marine food chain. Disruption at this level causes problems for smaller fish all the way up to whales and sharks. This same debris can also act as a vessel for non-native species to reach new habitats, disrupting isolated environments on islands and coral reefs. Last, but not least, is the impact of pollutants on the marine environment. Plastics can leach harmful chemicals while also absorbing others. When marine animals ingest this polluted material they may suffer directly (i.e., liver toxicity) or indirectly as these toxins make their way up the oceanic food chain. Concentrations of these pollutants in the water column damage overall ecosystem health and result in less stable environments. From single-use water bottles to microbeads from our facial cleansers, plastics find their way into our waters through a variety of means. One plastic pollutant that is lesser known, but gaining more and more awareness is microfibers. These tiny strands of plastic are found in synthetic fabrics such as polyester and rayon and, while synthetics were formerly reserved solely for high performance athletic gear, they now make up more than 60% of all clothing manufactured. With more and more everyday clothing containing these plastic fibers it’s no wonder that an estimated 1.7 million tons of microfibers are released into the ocean each year. Current studies show that microfibers are now the single largest contributor to watershed plastic pollution and one of the most prevalent forms of plastic pollution in our oceans. When synthetic clothing such as fleeces or yoga pants is washed, microfibers are released from the fabric and rinsed away with the washing water. They then make their way to water treatment centers where, due to their small size, a majority escape through the cleansing process and are released directly back into our waterways. Those that are captured in treatment centers become part of a muddy mass that is applied to fields as fertilizer. Carried by rivers, rain, and flood, these microfibers then end up in our oceans where they’re further dispersed by tides and currents or settle on the ocean floor. Once in the ocean, microfibers act as sponges, soaking up and transporting pollutants such as pesticides, industrial chemicals, and oil. These toxic fibers, whether found on the ocean floor or floating in the water column, are often ingested by ocean creatures such as clams, mussels, and fish causing negative health effects like liver toxicity. 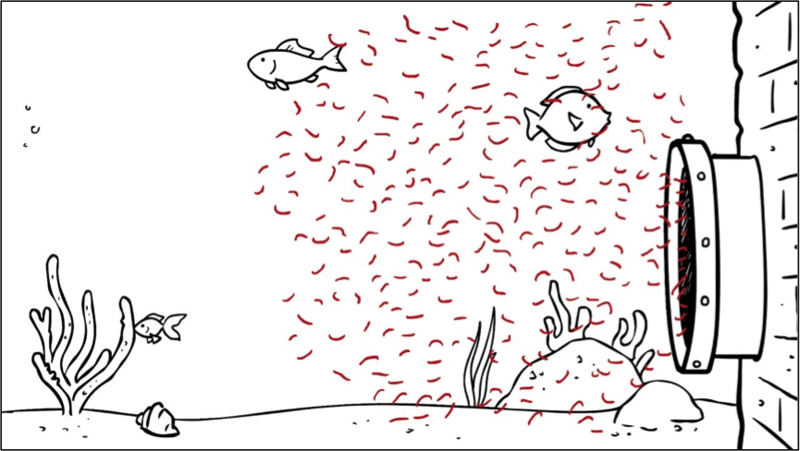 With these microfibers rapidly making their way through the oceanic food chain, plastic- and toxin-ridden fish regularly end up on our dinner plates. The simplest ways to prevent microfiber pollution at home are to purchase clothing made from natural products such as wool or cotton and high quality synthetics that last longer and require less frequent washing. When washing your synthetics, use specialized garment bags and machine filters that catch microfibers and prevent them from entering our water supply. Companies like Patagonia are leading the way by researching ways to construct more durable synthetic fabrics and providing customers with fabric care instructions. As with any other plastic pollution, it is important for individuals to be more mindful of the products they purchase and how they impact our shared environment. The use of plastics is so prevalent in today’s society that the simple act of washing your face can have negative impacts for the environment. The fault, in this instance, lies with microbeads, small spherical pieces of plastic made for exfoliating body scrubs, face washes, and toothpastes. Since being introduced to the market in the 1970s, these bath products now have a global impact and are manufactured by the world’s largest companies such as Revlon and Estée Lauder. Though these plastic beads commonly measure only a millimeter in diameter, their impact is large with microbeads being found in vast numbers across the world’s fresh and salt-water environments. It all starts with a bathroom drain. Once microbeads are washed down sinks and showers, they are carried to water treatment centers where they make their way through the treatment process and are carried back into the water supply. When heavy rains or sewage overflows occur, these concentrations of microbeads are carried to larger bodies of water such as the Great Lakes, Mississippi River, and ocean. After reaching the ocean, they may concentrate around coastal areas or be carried further to sea by tides and currents. Studies have shown that once microbeads reach a large body of water, they make their way rapidly up the food chain. Plankton ingest the beads, plankton are then eaten by fish, those same fish are eaten by larger fish, and on and on it goes until those fish, and all the pollutants that come with them, reach our dinner plates. Over time, as exposed to UV rays, the beads degrade causing them to absorb more pollutants and thus become more toxic. The negative effects of these toxins are felt by all creatures that ingest them and have been linked to birth defects and cancer in humans. In 2015, the United States Congress banned microbeads from consumer products demanding that they no longer be in production after July 2017. And while this is a great win for the environment, not all countries have enacted such restrictions. It is important to be a mindful consumer and not purchase products that contain these materials. If the product is listed as “exfoliating” or “scrubbing” be sure to check if the ingredients list includes things such as Polyethylene, Polypropylene, Polyethylene terephthalate, Polymethyl methacrylate or Nylon. If these ingredients are present, then so are microbeads. Starting in the 1970s, use of plastics worldwide has increased exponentially and as our use of these products has grown so too has the need to deal with the subsequent waste. Single-use disposable plastics are the main culprits in this widespread issue. From the straws we use in our drinks to the wrapping on items at the grocery, these products are a common part of modern society and so the plastic waste builds. Whether carried downstream through our rivers or dumped directly in the ocean from vessels, billions of pounds of plastic are added to the world’s oceans each year. And though our oceans are vast, the addition of this many plastics is having a detrimental effect on the environment and all life that depends upon it. The most common way plastics are carried to the oceans is through rivers. A recent study published in Environmental Science & Technology found that much of the world’s plastic marine waste can be traced to 10 major rivers in developing countries throughout Africa and Asia. Waste management is a key consideration as under-developed and overloaded sewer and disposal systems bring plastics into waterways. Once carried downstream and introduced to the marine environment, plastic items can be spread vast distances by wind and currents where they may collect in large rubbish heaps or disperse throughout the water table. There are several ways that plastics have a negative impact on marine ecosystems. Ingestion of plastics exposes marine animals to toxic chemicals that can lead to stomach and liver abnormalities. Equally sinister are the gut blockages that cause internal damage and even death. Larger plastic waste causes entanglements that lead to a slow death for marine animals such as whales, sea lions, and sharks. Unfortunately, once plastics reach the ocean, they become a permanent fixture of the marine environment as they do not quickly degrade and are not easily retrieved. Though widespread, it is possible to lessen the introduction and negative effects of plastics in the ocean. If more care is taken with waste management, especially near waterways, and single-use plastics are used more sparingly and recycled when possible, then the impact of plastics on our oceans can decrease considerably. Organizations like The Plastic Bank are using innovative solutions to address these issues and enact positive change at local, national, and global levels. There are also ways that we as individuals can make a difference whether by participating in beach cleanups or being more mindful about waste disposal in our communities. Starting on the ground, we can work to ensure these plastics never have a chance to reach our oceans in the first place. What’s for dinner? Hopefully it’s lionfish! Bermuda has just hosted the “Eat Lionfish Chefs Throwdown,” a lionfish cooking competition organized by 11th Hour Racing whereby featured celebrity chefs from the host nations of each America’s Cup team, competed to create the best lionfish dish. Chef Chris Kenny, Necker Island’s Head Chef, won the prize, and all involved were winners in raising awareness. The efficiency of invasive lionfish is impressive! They are literally out-breeding, out-eating and out-living native fish and other marine species. BREEDING: A female lionfish becomes sexually mature at one year old and can release up to two million eggs per year. Many of those eggs become larvae and then juvenile lionfish in environments where they can live relatively free from environmental pressures. EATING: Lionfish eat an amazing assortment of species including fish (the young of important commercial fish species such as snapper and grouper),invertebrates, mollusks, shrimp, crabs, juvenile octopus, squid, juvenile lobster and sea horses and in great quantities. Lionfish have been seen consuming 20 small fish in a 30-minute period and eating prey up to 2/3rds their size. Their stomachs can expand up to 30 times their normal size after a meal. These voracious appetites threaten both individual species as well as entire reef ecosystems. Some studies have shown that a single lionfish can reduce native marine creatures by 79% in its range within just 5 weeks. 2 Many of the species lionfish eat, such as grazers and cleaners, are ecologically critical to the health of the reef because they eat the algae that cover reefs, keeping the algae levels low enough that coral can survive and reproduce. Grazers include parrotfish, goatfish, wrasses, surgeonfish and tangs. Reefs are home to 25% of all known marine species and serve as shelter and protection to schools of many juvenile marine creatures. Because they are so flexible, lionfish are seldom without food but, if conditions require, lionfish can live without food for 3 months and beyond and lose very little body mass as a result. LIVING: Lionfish have impressive lifespans of 15-20 years and are spectacularly versatile in their ability to adapt to and thrive in different environments. For example, they have been spotted in water as shallow as 1’ deep and in water beyond 1,000’ deep. They live in oceans as well as brackish water estuaries and are able to tolerate water temperatures down to 50 degrees Fahrenheit. Sailors for the Sea http://sailorsforthesea.org, a nonprofit organization in Newport Rhode Island that unites boaters to protect the ocean, has witnessed lionfish in the cold water North Atlantic but claims “they don’t live long in our cooler waters and are unable to survive the tougher winters.”3 On top of all of this, lionfish appear biologically resistant to most diseases and parasites that affect native fish 4. Obviously, many people are working on solutions to this devastating problem. A number of techniques have been tried, among them, hunting lionfish (spearguns, pole spears and Hawaiian slings have proven most effective), training native species to eat lionfish and zapping and collecting lionfish with robots. Surprisingly, direct action by lionfish hunters is the most viable method for controlling lionfish currently in the very small areas divers can access. REEF.org5 is one of several organizations that sponsor lionfish derbies, in which hunters compete for the largest/smallest and most lionfish kills. It’s a nice way to raise awareness; the public is generally invited to participate, watching scoring, filleting and cooking demonstrations and tasting lionfish samples. And, the areas regularly maintained by such hunters have seen a demonstrable rebound of native fish over time. Some groups have tried training sharks and groupers to eat invasive lionfish with limited success and unintended consequences. In one experiment, the grouper were clearly afraid of the lionfish and appeared to prefer starvation to eating lionfish. Also, because fish don’t train their offspring, each generation of fish would have to be trained to eat lionfish, making this method cost prohibitive. Lastly, once trained, sharks, in particular, thereafter equate lionfish with food, putting lionfish hunters in significant danger. Robots In Service of the Environment (RISE) is a nonprofit organization attempting to solve the lionfish problem with robots that stun and then capture lionfish. One key benefit to using robots is that they can dive significantly deeper than humans and can potentially cover extensive areas. If successful, co-founder Colin Angle says, robots could capture enough lionfish to establish a new market in which “chefs can turn an environmental hazard into gourmet cuisine.” Angle wants lionfish hunting to become an online sport whereby users pay to hunt and capture fish by operating robots from an application. If it takes off, that would be an amazing way to both capture lionfish and raise awareness! The only way to possibly solve this problem is ifscientists, technologists, fishermen, divers, chefsand consumers coordinate their efforts. So, back to dinner, I’m taking the pledge to improve my healthy choices6 and order/buy delicious lionfish whenever possible. REEF also holds lionfish jewelry workshops which encourages yet another consumer market that promotes lionfish removal.